Plakans, Andrejs (2007). Experiencing Totalitarianism: The Invasion and Occupation of Latvia by the USSR and Nazi Germany 1939-1991. AuthorHouse. pp. 596. ISBN 9781434315731. http://books.google.com/books?id=p2nanp_wpnkC&dq. ^ Saburova, Irina (1955). “The Soviet Occupation of the Baltic States”. en:Russian Review 14 (1): 36–49. doi:10.2307/126075. ^ See, for instance, position expressed by European Parliament, which condemned "the fact that the occupation of these formerly independent and neutral States by the Soviet Union occurred in 1940 following the Molotov/Ribbentrop pact, and continues." European Parliament (1983-01-13). “Resolution on the situation in Estonia, Latvia, Lithuania”. Official Journal of the European Communities C 42/78. http://upload.wikimedia.org/wikipedia/en/8/80/Europarliament13011983.jpg. ^ （英語） Russia Pulls Last Troops Out of Baltics ザ・モスクワ・タイムズ. ^ Maltjukhov, Mikhail. The missed opportunity of Stalin. The Soviet Union and the fight for Europe: 1939-1941 (documents, facts, judgements). 2002, Moscow. 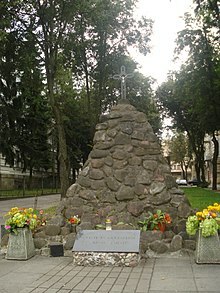 ^ "Tragedy of Maslenki - Latvia's Tragedy, June 15, 1940" Archived 2007年5月6日, at the Wayback Machine. ^ For Lithuania see, for instance, Thomas Remeikis (1975). 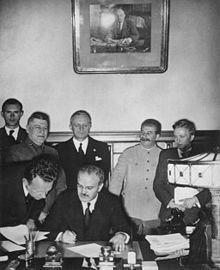 “The decision of the Lithuanian government to accept the Soviet ultimatum of June 14, 1940”. LITUANUS, Lithuanian Quarterly journal of Arts and Sciences 21 (No.4 - Winter 1975). http://www.lituanus.org/1975/75_4_02.htm 2007年3月3日閲覧。. ^ see report of Latvian Chargé d'affaires, Fricis Kociņš, regarding the talks with Soviet Foreign Commissar Molotov in I.Grava-Kreituse, I.Feldmanis, J.Goldmanis, A.Stranga. (1995) (latvian). Latvijas okupācija un aneksija 1939-1940: Dokumenti un materiāli. (The Occupation and Annexation of Latvia: 1939-1940. Documents and Materials.). pp. 348–350. http://www.historia.lv/alfabets/L/la/okupac/dokumenti/kocins/1940.21.06..htm. ^ for Estonia see, for instance, Tanel Kerikmäe, Hannes Vallikivi (2000). 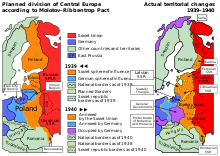 “State Continuity in the Light of Estonian Treaties Concluded before World War II”. Juridica International (I 2000): 30–39. http://www.juridica.ee/international_en.php?document=en/international/2000/1/22575.ART.0.pub.php 2007年3月3日閲覧。. ^ a b c d e en:Stephane Courtois; Werth, Nicolas; Panne, Jean-Louis; Paczkowski, Andrzej; Bartosek, Karel; Margolin, Jean-Louis & Kramer, Mark (1999). The en:Black Book of Communism: Crimes, Terror, Repression. en:Harvard University Press. ISBN 0-674-07608-7. ^ Mangulis, Visvaldis (1983). “VIII. September 1939 to June 1941”. Latvia in the Wars of the 20th century. Princeton Junction: Cognition Books. ISBN 0912881003. https://www.historia.lv/raksts/viii-september-1939-june-1941. ^ a b Švābe, Arvīds. The Story of Latvia. Latvian National Foundation. Stockholm. 1949. ^ Then acting U.S. Secretary of State, Sumner Wells described Soviet activities in the Baltic states as: "the devious process whereunder the political independence and territorial integrity of the three small Baltic republics - Estonia, Latvia and Lithuania - were to be deliberately annihilated by one of their more powerful neighbors." ^ European Parliament (1983-01-13). “Resolution on the situation in Estonia, Latvia, Lithuania”. Official Journal of the European Communities C 42/78. http://upload.wikimedia.org/wikipedia/en/8/80/Europarliament13011983.jpg. "whereas the Soviet annexations of the three Baltic States still has not been formally recognized by most European States and the USA, Canada, the United Kingdom, Australia and the Vatican still adhere to the concept of the Baltic States". ^ Van Elsuwege, P. (2003). “State Continuity and its Consequences: The Case of the Baltic States”. Leiden Journal of International Law 16: 377–388. doi:10.1017/S0922156503001195. ^ Malksoo, Lauri (2005). “Illegal Annexation and State Continuity: The Case of the Incorporation of the Baltic States by the USSR”. The American Journal of International Law 99 (3): 734–736. doi:10.2307/1602324. ^ Juda, Lawrence (1975). “United States' nonrecognition of the Soviet Union's annexation of the Baltic States: Politics and law”. en:Journal of Baltic Studies 6 (4): 272–290. ^ Mart Laar (2006) (Estonian). Sinimäed 1944: II maailmasõja lahingud Kirde-Eestis. Tallinn: Varrak. ^ The Holocaust in the Baltics Archived 2008年3月7日, at the Wayback Machine. ^ According to the most recent figures from the Latvian State Archives, 1,771 Latvian Jews were deported by the Soviets in June 1941, out of a total 15,424 deportees. Thus Jews made up 11% of the deportees at a time when their share of the total population of Latvia was only around 5%. See: Pelkaus, Elmārs (ed.) (2001) (Latvian, English, and Russian). Aizvestie: 1941. gada 14. jūnijā. Rīga: Latvijas Valsts arhīvs; Nordik. ISBN 9984675556. ^ Dieckmann, Christoph; Toleikis, Vytautas; and Zizas, Rimantas (2005) (Lithuanian and English). Karo belaisvių ir civilių gyventojų žudynės Lietuvoje, 1941–1944 = Murders of Prisoners of War and of Civilian Population in Lithuania, 1941–1944. Totalitarinių režimų nusikaltimai Lietuvoje 2. Vilnius: Margi Raštai. ISBN 9986092973. ^ a b c d e f g h i j Talmon, Stefan (2001). Recognition of Governments in International Law. Oxford University Press. pp. 103. ISBN 9780198265733. http://books.google.com/books?id=scc8EboiJX8C&pg=PA103&dq. ^ Hiden, John; Vahur Made, David J. Smith (2008). The Baltic Question During the Cold War. Routledge. pp. 120. ISBN 9780415371001. http://books.google.com/books?id=jx4JQycHtnkC&pg=PA120&dq. ^ Harriman, Averel & Abel, Elie. 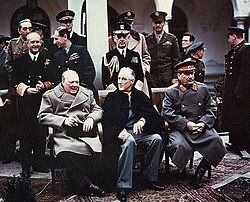 Special Envoy to Churchill and Stalin 1941-1946, Random House, New York. 1974. p. 1135. ^ Churchill, Winston. The Second World War (6 volumes). Houghton-Mifflin, Boston. 1953. v. 6. pp. 227-228. ^ A Do-Over for Russian History? at the Wall Street Journal. ^ League of Nations Treaty Series, Vol. XI, pp. 29-71. ^ Receuil de traités conclus par la Lithuanie avec les pays étrangérs, Vol. I, Kaunas, 1930, pp. 30-45. ^ League of Nations Treaty Series, 1920-21, No. 67, pp. 213-231. ^ the Peace Treaty with Estonia and Latvia, para. 2., Peace Treaty with Lithuania, para. 1. ^ Prof. Dr. G. von Rauch "Die Baltischen Staaten und Sowjetrussland 1919-1939", Europa Archiv No. 17 (1954), p. 6865. ^ Receuil des traités conclus par la Lithuanie avec les pays étrangés, Vol. I, Kaunas, 1930, pp. 429-435. ^ League of Nations Treaty Series, Vol. CXXXI, pp. 297-307. ^ Arts. I and IV of the Non-Aggression Treaties with Latvia and Estonia, and Arts. III and V of the Non-Aggression Treaty with Lithuania. ^ League of Nations Treaty Series, 1929, No. 2028. ^ League of Nations Treaty Series, 1928, No. 2137. ^ Aggression Defined at Time Magazine the Convention for the Definition of Aggression. ^ League of Nations Treaty Series, 1934, No. 3391. ^ League of Nations Treaties Series No. 4656/39, pp. 385-387. ^ B. Meissner, Die Sowjetunion, die Baltischen Staaten und das Volkerrecht, 1956, pp. 119-120. ^ Louis L. Snyder, Fifty Major Documents of the Twentieth Century, 1955, p. 92. ^ Foreign Relations of the United States, The Conference at Malta and Yalta, Washington, 1955, p. 977. ^ Scott, George (1973). The Rise and Fall of the League of Nations. London: Hutchinson & Co LTD. pp. 312, 398 ISBN 0-09-117040-0. Mälksoo, Lauri (2000). Professor Uluots, the Estonian Government in Exile and the Continuity of the Republic of Estonia in International Law. en:Nordic Journal of International Law 69.3, 289-316. Non-Recognition in the Courts: The Ships of the Baltic Republics by Herbert W. Briggs. In The American Journal of International Law Vol. 37, No. 4 (Oct., 1943), pp. 585-596.